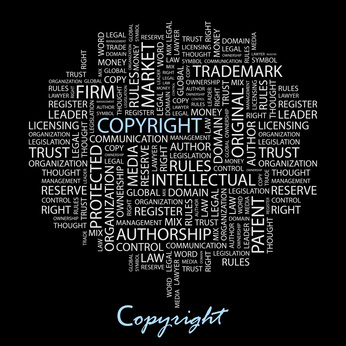 This is the third of a three-part series on the basics of copyright in blogging. Disclaimer: I am not an attorney, and this post should not in any way be construed as legal advice. I have done my best to educate myself in an informal way on the issue of copyright, and share what I have learned with that understanding. Two weeks ago, I talked about copyright as it applies to using images on our blogs. Last Monday, I focused on what is fair and legal use of others’ content. If you haven’t read those posts, please do so. I believe these issues are important to all of us as bloggers, whatever the purpose of our blogs might be. This week I’m looking at copyright as it applies to one’s own content. Yes, there are some issues here, as well. I can hear people saying, “It’s MY content, I don’t need permission to use it!” That’s true. But there are other considerations. Copyright protection: While it’s a fact that as soon as you write something, it is protected by copyright, and you own the copyright, you can’t control access to it when you’re posting it on the internet. It is important, therefore, to ensure that you state that your content is protected by copyright, at least by a statement somewhere on the main page of the blog itself, if not on every post. Here’s a link showing how to do that, from “Daily Blog Tips”. If you hold a Creative Commons license, there are specific rules about stating the rights to copy, and marking your work so that readers understand the boundaries. Here is what the Creative Commons website says. A concern I have about posting unpublished work online, on a blog, or in some other forum is a concern that is shared by some, but not all, writers and experts. How much is too much, and does one run the risk of one’s ideas or content being taken by others? Remember that we don’t know who all is reading our blogs – a public blog is just that, public. I used to post more about my works in progress, but have since become much more circumspect. Hayley Lavik in her blog raises some good points about the possibility of losing “first rights,” among other things, if one posts large writing samples on one’s blog. My own feeling is that it’s better to err on the side of caution, particularly when posting unpublished excerpts from something you will eventually want to submit for publication. I perhaps take this to an extreme, being reluctant to answer “what’s it about” questions about my works in progress, or to post pitches online. Each person has their own level of comfort in this area. Some people, like Jane Friedman, urge people to relax about this question, others urge caution. (Unfortunately, the link to Chuck Sambuchino’s opposing view, which both Hayley and Jane give in their discussions on this topic, is no longer a working link.) EDITED TO ADD: Here is an updated link to Chuck Sambuchino’s views. Thank you so much, Hayley Lavik, for providing the link! What are your thoughts? How much do you post? I’d be interested to hear other’s opinions on this. This is still all so new to me. I’ve visited other blogs where I see the Copyright statement. Although I know not to use stuff from their blog without their permission or to at least ensure that I link back to the original post, there are others who either don’t know or don’t care. I haven’t added the Copyright statement to my blog. I’m still on the fence about it. I remember a blogger mentioning they were interested in putting their short stories up for consideration with a particular press, but then remembered she’d posted the stories on her blog. Pretty much every comment agreed with what you mentioned here, that by doing so, she has, in a sense, “published” the material and that she may not get any takers. Not sure how that works out. It doesn’t hurt anything to put the copyright statement on your blog, and it might be a good reminder to people. You’re right about the copyright statement. It’s something I’d better check on my own blog. And I’m with your – I tend to err on the side of caution with what I post. I’ve heard some publishers will consider that something has been previously published if it’s been publicly posted on a blog either in its entirety or even a very large percentage. Something to think about. Thanks again for this very informative series! You’re welcome — thanks for reading. And I’m glad to hear I’m not the only one who’s cautious. Very good post, Beth. I know I don’t share what I’m writing about. But have been amazed at the level of sharing I’ve seen of WIP. I am cautious and will always remain so. And, I’ve had people do pingbacks to my blog, only to find out that the blog doesn’t exist and is a standard WP site, with many other people’s blogs posted. I never approve the pingbacks, but my site is listed. It’s tricky to protect yourself. Thanks for the sites. I am very surprised at the amount of detail some people share seemingly willy-nilly. That’s odd about the pingbacks. Thanks for mentioning those — although I don’t know what a person is to do about them. Thanks so much, Hayley! I’ll edit my post to add this link immediately. I am with you all on the side of caution. The poems I share, for example, are not ones I would plan on publishing. I have not hand any pingbacks to blogs that don’t exist, though. Excellent set of posts, which I have bookmarked, Beth. Thanks, Joanna. You’re wise about choosing what to share and what not to. And the poems you *do* share are wonderful! I agree that being cautious is the best approach. I started adding a little copyright watermark to my photos a while ago but I’m not sure what use it is. At least it makes me feel more secure. Someone could easily crop it off. But who would steal my miaos? Another thing I’ve noticed on food blogs is people copying entire recipes from cookbooks. I don’t see an issue with adapting recipes and acknowledging where the inspiration was from, but copying whole recipes seems like an infringement. Thanks, LittleMiao. I’ve noticed the copyright watermark on your photos, and I’ve thought it’s an excellent idea. Those are such lovely photos! Copying whole recipes sounds like infringement to me. People seem to think that if it’s on the internet it’s theirs for the taking. Not so. Thank you for letting me know, Kirsten. I’m glad that my post helped you to consider this subject and take action. Good for you! Thanks for this copyright series, I read all three post. I learned a lot and even though I am not a professional writer just a blog writer this helped a lot. I’ve been baffled about using the images of others in my blog but now I think I know how it’s supposed to work. Thanks Beth. Thanks, Leena! I’m glad it’s been of use to you — and I’m delighted to see you visiting here! Hope you’ll stop in again! I’m glad you dedicated three posts to such an important topic. Thank you! You’re welcome. It’s a subject that is very important to me. Thanks for reading! Me too. And Robbbie. Poor Robbbie..